A guide to the baths of Bath. Opens in a new window. 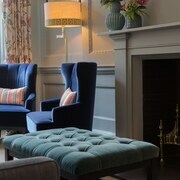 A wonderful quirky hotel in central Bath. Excellent breakfast and efficient smiling staff. 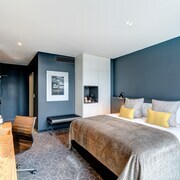 Where to find Bath hotels near an airport? 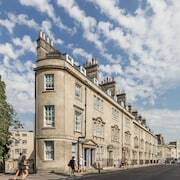 How can I find hotels in different Bath neighborhoods? Where can I find hotels in Bath that are near tourist attractions? There are numerous possibilities for those visitors searching for an affordable or upscale hotel in or around Bath. Expedia lists 71 accommodation options within a 0.1-kilometre (0.06-mile) distance of the center of Bath. Visitors hoping to stay in a nice central location in Bath, should check out the Royal Crescent Hotel and The Bath House Apartments. Limpley Stoke is an area that is 6 kilometres (4 miles) from the heart of Bath and has the biggest range of Bath hotels. 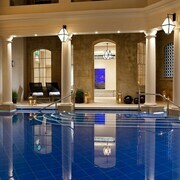 Limpley Stoke places to base yourself are the Homewood Park Hotel & Spa - Bath and Best Western Limpley Stoke Hotel. Radstock, Midford and Bathampton are some other Bath neighborhoods that have accommodation options. If you intend to book somewhere to stay in Radstock, choose from between the Best Western Plus Centurion Hotel and Holcombe Inn. Or, if you choose to book a hotel in Midford, you can take your pick from the Brooks' View and Tucking Mill View. In Bathampton visitors can choose from Bailbrook House and Tasburgh House. Bath is known for the Roman Baths. The The Bath Priory Hotel and Spa and Macdonald Bath Spa, are convenient options for visitors because they are within a 0.1 kilometres (0.06 miles) radius of Roman Baths. Accommodation options close to the University of Bath include the The Ayrlington and the Combe Grove. The The Queensberry Hotel and Francis Hotel Bath - MGallery by Sofitel are situated near the Royal Crescent. The Jane Austen Centre, another popular Bath attraction, is not far from the Abbey Hotel and the Harington's Hotel. 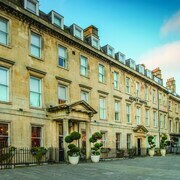 Accommodations that are close to the Bath Assembly Rooms include the The Halcyon and the Brindleys Boutique Bed & Breakfast. If you have very few wishes and are after mid-range or low-budget Bath accommodation options, there are economy hotels available in the area. The Bloomfield House is 2 kilometres (1 mile) from the heart of Bath, while the Cranleigh is 3 kilometres (2 miles) away. 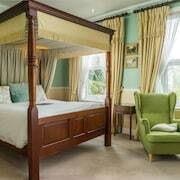 Some more budget-concious options in Bath are the Holiday Inn Express Bath and the Oldfields House - Bed & Breakfast. 10 kilometres (6 miles) away from the heart of Bath, is the Lucknam Park. The Oak House No.1 is 30 kilometres (20 miles) away. Some other hotel and apartment options in the area are the Manor House Hotel and Golf Club and the The Bishopstrow Hotel & Spa. The larger Somerset area is certainly worth exploring also. Spend time at Somerset's ruins and castles. You could also take the time to enjoy its rural landscapes and forests. Visitors and locals alike in this region of England enjoy mountain biking. Weston-super-Mare can be found 16 kilometres (10 miles) to the southwest of Bath. While here, take the time to enjoy the Radstock Museum. Radstock features some great places to stay. Or, you can find Weston-super-Mare, 45 kilometres (27 miles) to the west of Bath. In Weston-super-Mare, be sure to check out the Grand Pier. 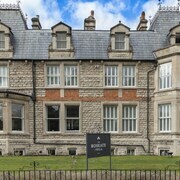 The Church House - Guest House and Spreyton Guest House are all good places to stay. Bristol International Airport is a practical airport, and is located 25 kilometres (15 miles) away from Bath. Expedia-listed hotels close to Bristol International Airport include Redhill House Bristol Airport and Holiday Inn Bristol Airport. 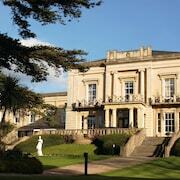 What are the most popular Bath hotels? Are there hotels in other cities near Bath? What other types of accommodations are available in Bath? Explore Bath with Expedia.ca’s Travel Guides to find the best flights, cars, holiday packages and more!